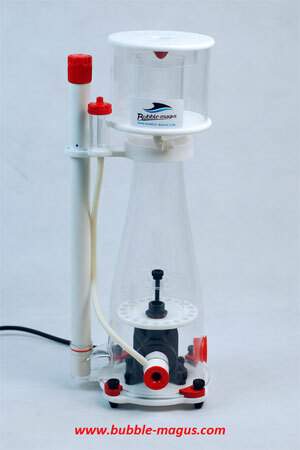 Bubble Magus Curve 9 Protein Skimmer is suitable for use in aquariums of 500 to 900 litres. It uses the Bubble Magus Rock SP4000 pump which has a needle-wheel impeller for maximum bubble production. The Bubble Magus Curve 9 uses little space and is simple to install and maintain. It is designed to be used in a sump and requires a water depth of 240 - 280mm for safe operation. Contents: Supplied complete with pump and ready for use. Suitable for: marine aquaria only.